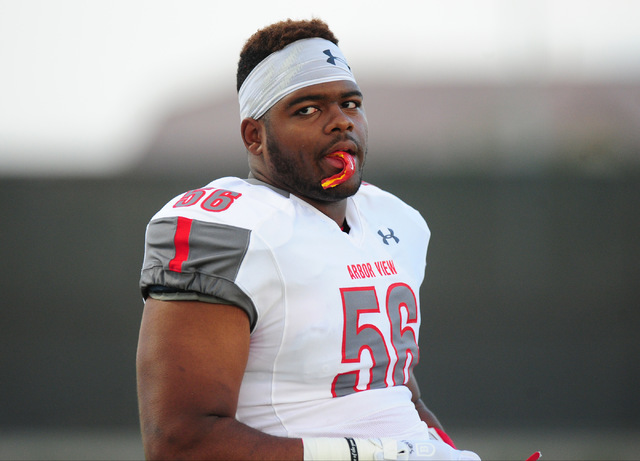 Arbor View defensive lineman Greg Rogers, one of the state’s top prospects in the class of 2017, made an oral commitment to UCLA on Monday. Rogers’ commitment is nonbinding, and the first day he can sign a letter of intent is Feb. 1. UCLA’s coaches cannot comment until that time. Rogers made his announcement in a “Goodfellas”-themed video that was released through Bleacher Report. The 6-foot-3-inch, 310-pound Rogers had more than 25 scholarship offers and was being courted by schools from all of the Power Five conferences. He chose the Bruins over Arizona State, Colorado, Oklahoma and Southern California. Rogers played a key role in Arbor View’s win Friday in the Class 4A Sunset Region semifinals, as the Aggies controlled Legacy running back Samuel Turner. He is second on the team with 51 tackles and five sacks. Last season, Rogers had 64 tackles, 17 tackles for loss and six sacks and was named first-team all-state at Centennial before he transferred to Arbor View in January.